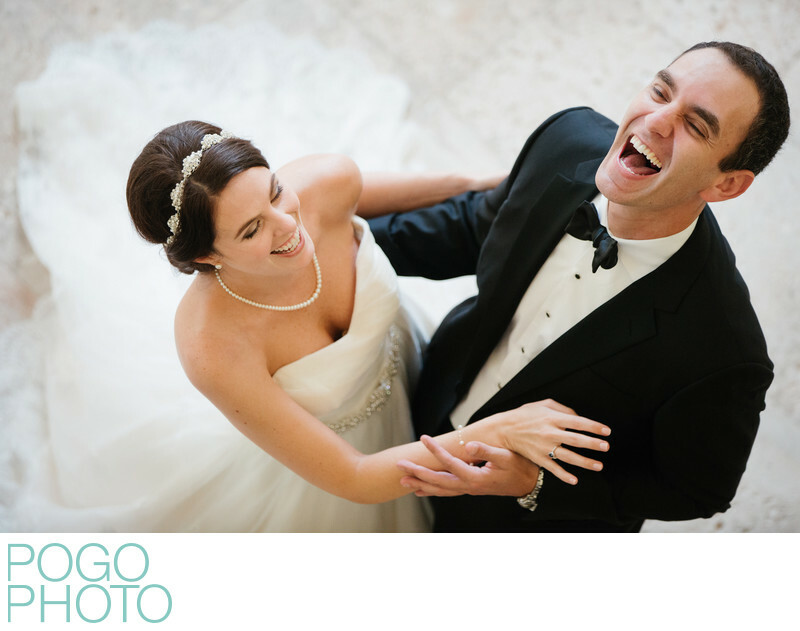 Taken from above, this photo of a couple laughing hysterically is one of our favorite images from our Florida wedding season that year. It was captured at Old Palm Golf Course, one of the best venues available to a Palm Beach Gardens wedding photographer. Located in northern Palm Beach County, the city of Palm Beach Gardens is known as an affluent community, home to great shopping, dining, and recreation. The infrastructure catering to leisure and luxury lends itself to dozens of lavish options for wedding venues. As most of the best wedding reception locations are located in gated residential communities, there are several hotels in the area ready to accommodate visiting guests, most of which offer locations for rehearsal dinners or events themselves. Palm Beach Gardens has seen a great deal of expansion in recent years and entire new shopping centers have opened up west of I-95, bringing with them dozen of new restaurants and shops. Some of these new locally owned stores are replete with creative and memorable items that can be worked into a wedding day to capture the feel and appeal of the area. Palm Beach Gardens has become an impressive player in the international golf game and the clubs built around these now infamous courses are home to weddings that match the elevated level of opulence omnipresent in the city. In case the golfing culture of Palm Beach Gardens was even in question, keep in mind that the main thoroughfare through the town in aptly named PGA Boulevard, and when its easternmost portion turns south along Singer Island its name changes to Jack Nicklaus Drive. Palm Beach Gardens is adjacent to our winter hometown of Jupiter, FL with the dividing line being Donald Ross Road, appropriately named after a famed golf course designer. Donald Ross had a hand in the design of approximately 400 different courses across the United States, with one of his crowning achievements, Seminole Golf Club, opening in 1927 in what is now Palm Beach Gardens. Seminole is just north of Lost Tree Club, another exclusive community whose clubhouse serves as an exquisite place to host a wedding. Lost Tree’s golf club is just blocks from the ocean while its tennis courts and beach house are right on the beach, providing two excellent locations that can be used for first looks and reception spaces. Continuing southward the next main landmark is John D. MacArthur State Park, named after the area’s largest landholder until the 1950s. This natural area along the barrier island has hosted plenty of wedding ceremonies over the years as well as dozens of our engagement and portrait sessions. As a Palm Beach Gardens wedding photographer, you frequently get spoiled working at places like BallenIsles, Mirasol, and PGA National. Each club has a feel all its own, despite the fact that all three of them, along with Old Palm, are basically in the same place, forming the four corners of the intersection of PGA Boulevard and Florida’s Turnpike. Mirasol is the newest kid on the block, but they were the first club to lure the Honda Classic out of Broward County. Moving to Mirasol in 2003, The Honda Classic is a PGA tour event dating back to the 1970s when it was played in Lauderhill. It has since moved across the street to the Champion Course at PGA National, bolstering the local economy for nearly a decade and a half. BallenIsles, an equity club on the southeast corner, was the original PGA National Golf Club before its namesake moved next door. BallenIsles now boasts one of the top tennis facilities in the country, lining up perfectly with the three stellar courses, one of which has hosted the PGA Championship and the World Cup Championship. Location: Old Palm Golf Club, 11889 Old Palm Dr, Palm Beach Gardens, FL 33418. 1/400; f/2.8; ISO 1250; 145.0 mm.